Posted on July 6, 2014 January 3, 2019 by Marty Schoenleber, Jr.
A friend recently post a Facebook link to an old R.E.M. song. He called them one of his favorite bands. I think he has good taste. I too have always thought of R.E.M. as one of those bands that was more interested in good music than big commercial success (though they have had both). 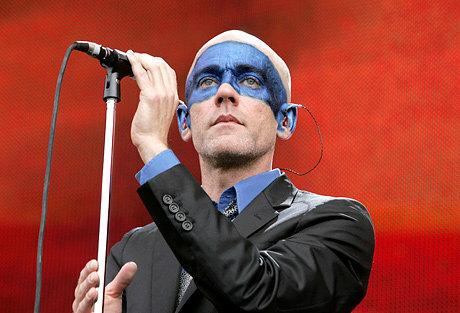 The face of the group, the androgynous Michael Stipe, possesses not only an interesting voice but a compassionate heart. Songs like “Everybody Hurts” (lyrics below) is part of the evidence of a man who knows the pain of life and wants to help those who suffer. What strikes me however is that the song, though filled with pathos, and carried evocatively into the depths of the listeners soul by both Stipe’s voice and the muscial arrangement, and that makes one long to help those who suffer with the darkness of night that all of us go through periodically, its exhortation to “hang on” is . . . well, frankly . . . weak and only marginally helpful. “Hold on” sings Stipe, with great passion because, “everybody hurts”. In other words “hold on because we all go through it. This will pass.” Here’s the full text of the lyrics. Five times I received at the hands of the Jews the forty lashes less one. Three times I was beaten with rods. Once I was stoned. Three times I was shipwrecked; a night and a day I was adrift at sea; on frequent journeys, in danger from rivers, danger from robbers, danger from my own people, danger from Gentiles, danger in the city, danger in the wilderness, danger at sea, danger from false brothers; in toil and hardship, through many a sleepless night, in hunger and thirst, often without food, in cold and exposure. And, apart from other things, there is the daily pressure on me of my anxiety for all the churches. That’s a whole boatload of stuff to “hang on” through. Everybody hurts, everybody, no exceptions. We are afflicted in every way, but not crushed; perplexed, but not driven to despair; persecuted, but not forsaken; struck down, but not destroyed; always carrying in the body the death of Jesus, so that the life of Jesus may also be manifested in our bodies. For we who live are always being given over to death for Jesus’ sake, so that the life of Jesus also may be manifested in our mortal flesh. So death is at work in us, but life in you. In light of the riches of the gospel “hang on, everybody hurts” seems like the empty help of Job’s friends in his dark night. We have a better hope in Christ. And that is worth not only rejoicing in for ourselves, but telling the world of “the excellencies of our God” (1 Peter 2:9). Never doubt, that it is the gospel that the world desperately needs. Posted in Sunday MusingsTagged 1 Peter 2, 2 Corinthians 11, 2 Corinthians 4, Depression, Job, Job's Friends, Michael Stipe, R.E.M.